I agree, no one changed their minds. I do feel it was an opportunity for many Americans to see and hear their candidate for the first time outside of campaign events. Jesus - that trigger warning sign is pathetic - even if it was for the MTV event. Clinton won this one in my view - Trump looked rattled. Who won or lost depends on what result either side was looking for. Hillary set out to get a killer blow by making Trump look unelectable by being unsuitable for fundamental reasons - she called him racist, sexist and mad to his face - the same things being said in the negative ad campaigns on TV. In that she failed. For Trump the bar was set much lower, he just had to come across as a viable alternate candidate in the debates, in that he succeeded. He wasn't brilliant, but he didn't come across as unqualified. He avoided retaliating by bringing Bill's affairs etc - trying hard to seem presidential even when they threw up the ball about Hillary's "stamina". The views stated above that few people would have changed their mind because of the debate show he cleared the bar set in that he avoided a bullet. I'm inclined to agree ORAC. I genuinely wanted to see Trump do well. I think he is a fake but for the sake of providing credibility to the politicol process in the US, i was hoping he would at least look convincing. He is a buffoon. He cannot even provide a coherent sentence without interupting his own train of thought. As far as i am concerned it was a Tie....seemed to me Trump was having to debate the Moderator as much as he was Hillary. Was it me or was Hillary reading from prepared Notes....she sure seemed like she was looking down and reading from a script? You don't reckon she had a Heads Up on some of the questions do you....surely the NBC News guy wouldn't give Clinton and advance notice would he? Her answers seemed far too smooth....no hesitation...no stammering....and damn sure no Gotcha questions for her as there were for Trump. Don't you think the "Basket of Deplorables" comment should have drawn a question? No Question about her Health.....or about the Clinton Foundation....or the Emails? All very important questions when it comes to her suitability for the office....and every bit as important as Trump's Tax Returns, Business Bankruptcies, and Birther issue in my view. In the next day or two we will see a Tally of the questions and how each Candidate fared in the kinds of questions they drew from the Moderator. Then we will know better how even handed the Moderator was tonight. As to the Moderator fact checking Trump four times...but not Clinton at all....and being wrong on "Stop and Frisk" being Un-Constitutional....none of the three of them debating tonight know the Law. Terry V Ohio is the existing Supreme Court Case that deals with "Stop and Frisk"....and clearly confirms that it is Constitutional. How that procedure is applied and conducted determines if it is an Illegal Search. It is not "profiling" no matter how our Leftie Friends argue. An abuse of it might be...but the quick search laid out in Terry is not illegal at all. They were arguing about a single Federal Case targeting the NYPD use of "Stop and Frisk" techniques which was found to be used on Blacks and Hispanics more than on other Races. That case was sent back to the lower court for re-trial but Mayor De Blazio a very Liberal Mayor of NYC declined to retry the case in a New York Court. Terry remains in effect nationwide to include NYC. oicu812.again.......Entirely predictable post. Rule 5 strikes again. Last edited by SASless; 27th Sep 2016 at 05:57. Early Polling shows Trump won (57%), Holt seen as unfair (71%)....Media Critics are not happy with Holt. This is not going to look good for Clinton over the next few days if that can of polling is what starts showing up in broader circles. ORAC, I am fairly agreed if we take out the "Hillary set out" bit. Debate prep and being comfortable in your knowledge of the issues. There were no 'gotcha questions' for Trump. Considering what has come out of the GOP candidate's mouth over the last long year, the moderator gave him a break. That would only have given Trump a pulpit from which to speak to his base. The network is not that dumb. Emails are old news out here in the real world. The foundation will likely (should) be brought up in one of the next debates along with Trump's international business relationships. Health? Hillary looked a whole lot healthier than Trump this evening. She wasn't sweating, snorting nor slurping water all night like her opponent who was also looking a bit constipated. Are you talking about the miraculous new medical miracle (notice I said miraculous and miracle in the space of just three words) of diagnosis by video palpate? A draw. Screwed either way. I wouldn't trust polling from people up late on the east coast and those who just suffered through the debate elsewhere. Wait for a day or so. Then we will have the real numbers. As to your 'media critics' care to throw a few names round? I disagree. There is much more potential promise in a Clinton presidency than anything Trump could muster. Can we be real? Can we talk together like reasonable men? You can have a read of the debate format here. Last edited by StudentInDebt; 27th Sep 2016 at 07:20. Trump was the clear winner on every count and Clinton was embarrassing to watch, the only people who will tell you otherwise are the media. I must have been watching a different debate. The prospect of that buffoon becoming the leader of the free world is a scary prospect indeed! So what we have here is an Ozzy not getting a Kiwi's sarcasm, and the subject is US Politics???? I'll think you'll find that JH was being a tad sarcastic in order to mock the conspiracy theorist nutjobs amongst us. They'll tell you that Trump must win, and any discussion to the contrary is because the media have all colluded in a vast conspiracy against him. The greater GOP is also a part of this conspiracy. 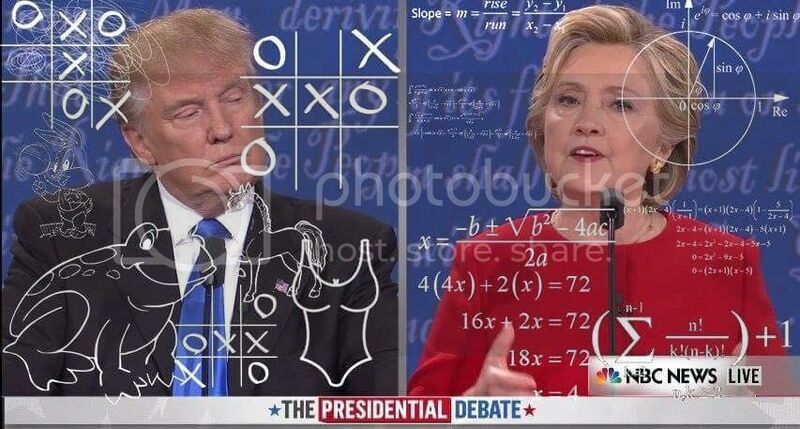 Therefore, if Trump loses anything, from a debate to the election itself, 'it was rigged!'. These same people also believe Oswald was a patsy, Kubrick filmed the moon landings, Sandy Hook was a false flag, and 9/11 was an inside job. They also pray to Alex Jones. "That was a great speech Mr President. Every thinking American will vote for you." "That's not enough. I need a majority." There is a small trick in speaking to convince people of something - anything. When I heard Trump say something about "stamina" four times in the course of 12 seconds, I gave up. He is certainly not a smooth orator, neither does he seem to be able to order his thoughts into a logically coherent train of words and sentences, it is more a stream of badly slung together slogans. Perhaps they should let Obama serve a third term....it might be the lesser of three evils.